You can only spend a certain amount of money on your credit card. Your credit card issuer assigns a credit limit to your account which is the maximum amount of outstanding debt you're allowed to have on your account at any given time. You can keep making purchases up to the amount of your credit limit as long as you have available credit. Knowing your available credit is important if you want to keep your credit card balance within the credit limit. Depending on your credit card terms, there may be penalties and consequences for exceeding your credit card balance. Your available credit is the amount of credit you are able to use for purchases at a point in time. The amount changes based on your credit card balance and your credit limit. The available credit on your credit card is usually your credit limit minus your current balance, but it could be lower if you have pending transactions that haven't posted to your credit card yet. For example, if your credit limit is $2,000 and you have a balance of $500, then you would have $1,500 of available credit. A pending transaction of $100 would reduce your available credit to $1,400. You can check your available credit by calling your credit card issuer via the number on the back of your credit card or by logging into your online account. Note that your credit card billing statement isn't the best place to check your available credit because of the transactions that may have posted to your account since your billing statement was printed. Having a lot of available credit is good for your credit score because it means you're keeping your credit card balance low. Consequently, your credit utilization, which is 30 percent of your credit score, will also be low. It's a good idea to keep your credit card balance below 30 percent of your credit limit. That means you'll have a balance of $300 and $700 available credit on a credit card with a limit of $1,000. The less available credit you have, the less valuable your credit card is to you. With only a small amount of available credit, you won't be able to use your credit when you need it, for example, to rent a car or book a hotel. Instead, you'll have to use your debit card which could require a security deposit or extra documentation for certain transactions. What Happens if You Use More Than Your Available Credit? 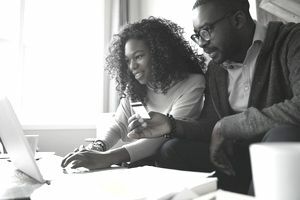 If you try to spend more than your available credit, your transaction will be declined, unless you've opted-in to have over-the-limit transactions processed. Opting-in allows our credit card issuer to process transactions that would put you over the credit limit, but leaves you susceptible to an over the limit fee, if your credit card issuer charges one. Exceeding your credit limit can also trigger the penalty rate on your credit card. You can increase the amount of available credit on your credit card by paying down your balance. Once the payment posts to your account, your available credit increases by the amount you paid. Note that it could take two or three business days for the payment to reflect in your available credit, depending on your credit card issuer's payment posting policy. If you're trying to free up some credit for a purchase, you'll typically need to make a payment several days in advance of when you need it. A credit limit increase can also raise your available credit. You can request a credit limit increase from your credit card issuer and they'll evaluate your account and credit history to approve your request. You'll still have the same amount of debt, but if approved, the credit limit increase will raise your available credit.